In reflecting on the year, I do have a ton to be grateful for. But in all honesty, I'm ready to say goodbye to this year and hello to tomorrow. If you've been following this blog since the beginning - when it was more of a personal blog - you know that I don't sugar coat things. I tell everything how it is and how it is, is tough for us right now. We moved to a new city and continued to be financially-tied to our old one. We love Philadelphia, but paying a mortgage and rent has not been easy. I do NOT recommend anyone ever do this, ever. EVER. On a brighter note, we have made some amazing new friends here and I'm so grateful for the new community we have created in Philadelphia. We also had some incredible opportunities this year and worked with the most amazing clients and photographers in the world. 2014 is for balance. For health. For control. For growth, both personally and professionally. And at a rate that we can keep up with. 2014 is for working smarter, not harder (although, we're committed to working pretty damn hard). 2014 is for acknowledging when we're feeling overwhelmed and asking for help when necessary. 2014 is for being an awesome human being. For being present. For reconnecting. For loosening the grip technology has over us. For giving 110% to a limited amount of clients so we can give them the time and attention they deserve and need from us. 2014 is for creating boundaries. For breaking rules. Basically, 2014 is for all the things. 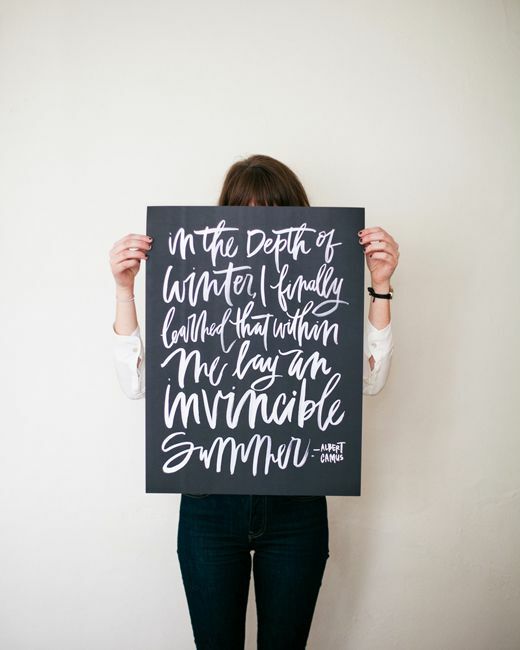 In the depth of winter, I finally learned that within me lay an invincible summer. 2014 is for finding my super powers.